Every day I will be doing updates on not only for Dizzy Hearts, but also Vagabond. Dizzy Hearts is already written, all it takes is the funding in order to produce a script, to do the art, music and to program it. However large parts of Vagabond are still in development. Although the story is pretty much done as well, I will have to hire staff to assist with some of the more complex parts of the game. So today I am going to talk about Alabast. Alabast or as it's known in that region by merchants "The Sail in the Desert". 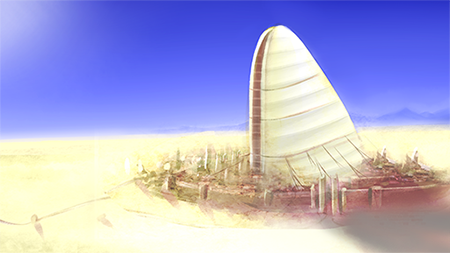 As far as structures go, Alabast's sail is the tallest structure on the planet. Even by human standards, the Great Sail is a megalithic structure. Constructed in the country of Prima Alabasta, it is not only a monument, it is a skyscraper, a home to the aristocracy of Alabast. It is not just one sail, but two, an opposite pair that shelters a single, large spinning helical wind-turbine. The very reason for the design of the sail, is to act as a wing, focusing the wind that blows through the country from the mountainous rift. Through this turbine, they not only cool this massive structure, but also provide primitive power to it's inhabitants. Once the single country of Alabasta, it was split forcibly into the country of Prima Alabasta, and the much smaller Secundo Alabasta after the creation of Alabast's great sail. The creation of which nearly bankrupted the entire country. Such a feat has undoubtedly brought great wealth to Alabast, but not without a cost. While the infallible aristocracy rules over Alabast, it's citizens are anything but affluent. Indentured to the state, and outlawed from ever stepping foot inside the sail, they live in it's shadow, trying to eke out an existence. However there is a much darker secret about Alabast's great wealth and success.